People who know me will know that I am a sucker for novelty packaging. 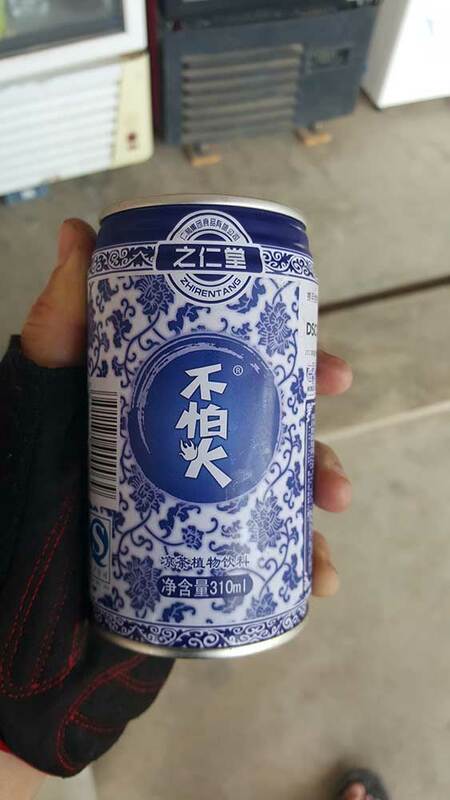 China has capitalised on people like me with their seemingly limitless range of cold drinks. 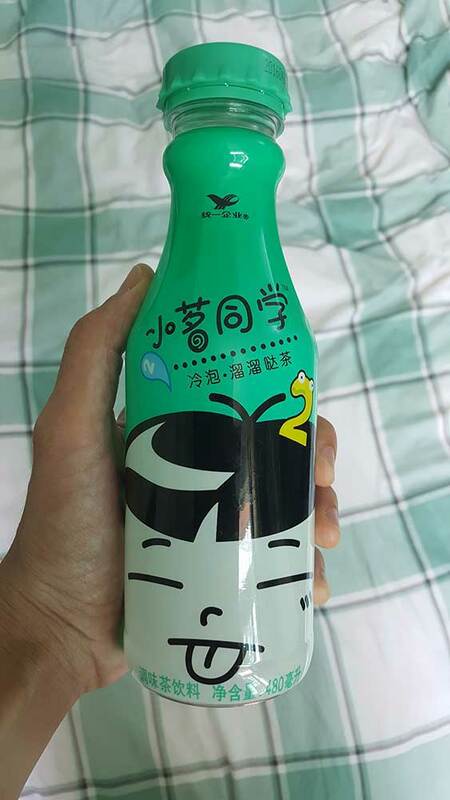 The problem is, I can’t read Chinese and so the only way to know what each bottle contains is to drink them all. Here is what I have learned. Look at this one. It’s just tea, but a non-reader could not possibly have known that. 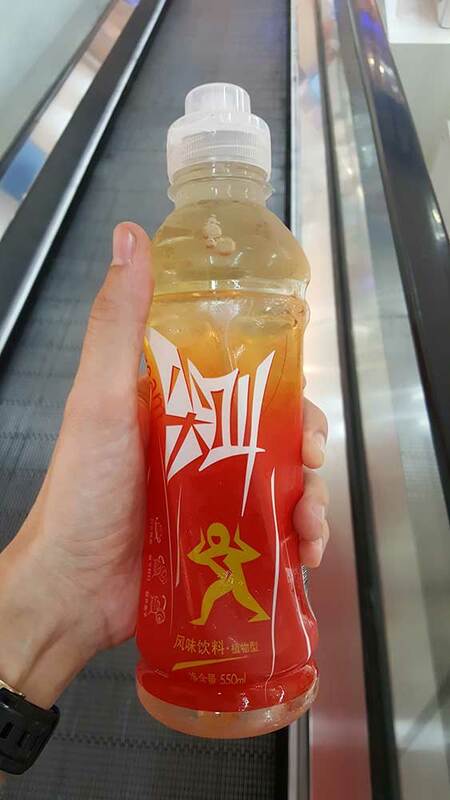 Dominating the bottle is what I thought would be considered quite a racist face, and the smattering of xbox controllers and the pixelated ‘2’ gives the impression that this beverage produces the energy required for a 48-hour non-stop gaming marathon in a darkened room. I mean, look at that guy. He’s tweaking out. But it was just tea. Admittedly, the tea was quite sweet, and so twitchy mister bottle guy could potentially have reached his current state by drinking gallons of it. He might also have a disease. The sad truth is we simply haven’t learned enough about him to come to a realistic conclusion. Look familiar? 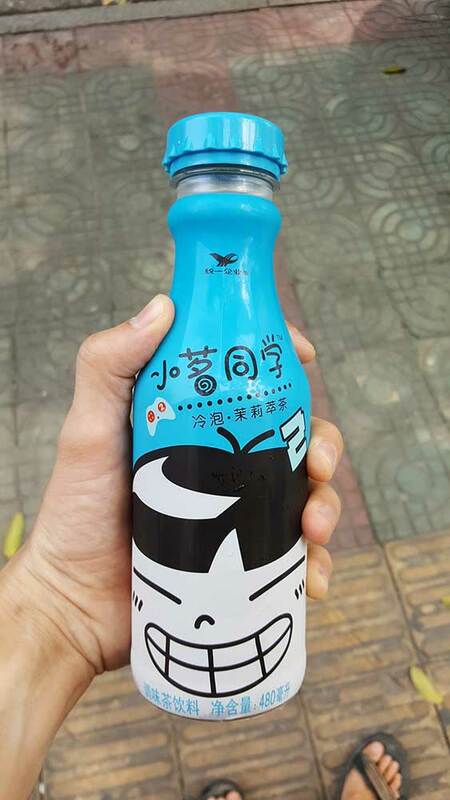 Well, there is a whole series of these racist face bottles. When I drunk this one I didn’t know what was going on. It tasted like yogurt mixed with sweet lemon juice. Tangy and sweet and savoury and weird and no, I didn’t particularly like it. There was also a yellow bottle in this series, but after being relatively disappointed twice I opted not to try it. This (the only can in this post) was a gamble. We were halfway through a cycle and I decided to choose this drink not knowing whether it was something that helped with erectile dysfunctions, or beer, or what. I got lucky this time. It was what Malaysians will know as cin cau, which is a black herbal drink that helps to cool you down. It’s sweet and kind of bitter at the same time, and it tastes like nothing else anywhere. It was good for cycling on a hot day. The odd thing is that if somebody decided to write on the side, ‘contents bequeath man’s tool with vigour of alpha cheetah’, I doubt anybody would question it. Hell, they might even sell more cans that way. After all, this is a country that consumes a large amount of tiger penises for that very same reason. How could I resist this vampire girl and her pet cat-dragon thing with horns bursting from its lower lip, clearly ruling out the use of cat flaps? Answer: I could not. 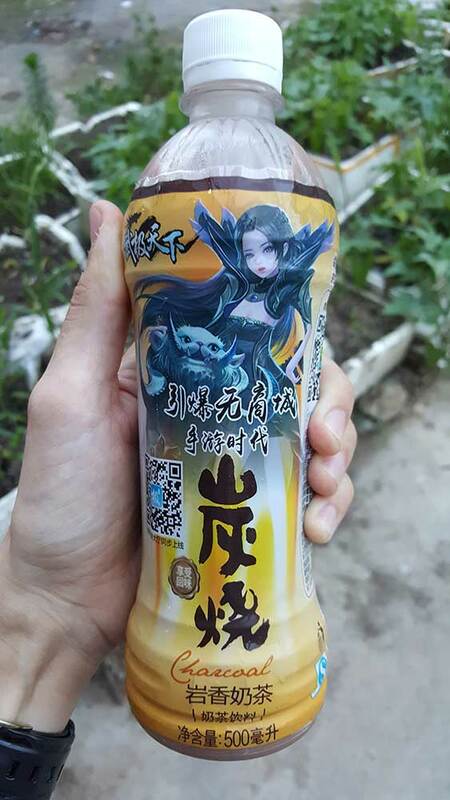 “Charcoal,” the bottle states matter-of-factly, and it was pretty obvious that the contents were some kind of milk tea. All in all, this drinking experience was mostly a forgettable one. This one should be obvious, right? Well… it was. It was a mix of squeezed lime and orange juice (probably from concentrate) with a heavy emphasis on the orange. It had pulp. It was fun. This was a total enigma. 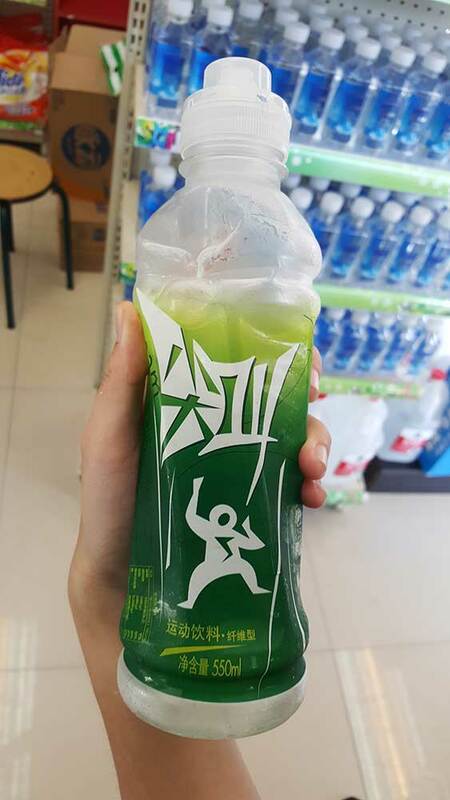 So much is going on with this bottle that I don’t know where to begin. So let’s re-enact the marketing meeting between Marketing Person 1 (MP1), Marketing Person 2 (MP2), and the eccentric, wildcard boss who ultimately has the last say and nobody dares to argue with (WCB). MP1: You know those surplus plastic bowler hats we have? They fit onto bottle lids. MP1: We could use them on that line of gentleman-themed beverages we’ve been talking about. It’s gimmicky, but it might attract people. MP2: So what should the bottle look like? WCB: YELLOW! RED FLAMES! BIG FONT! MP2: O… okay sir. I’ll put that down. WCB: SAMURAI BOY! CROCODILE FACE ON HEAD! WCB: NOT COSTUME, JUST SWORD! T-SHIRT AND PANTS! MP1: With a crocodile, was it a crocodile… face? On his head? WCB: TEA POT! HE’S STOMPING ON A TEA POT! HIS ARMS ARE IN A DEFENSIVE POSITION! WCB: NO NO NO! CROSS OUT THE TEA! BUT KEEP THE POT! 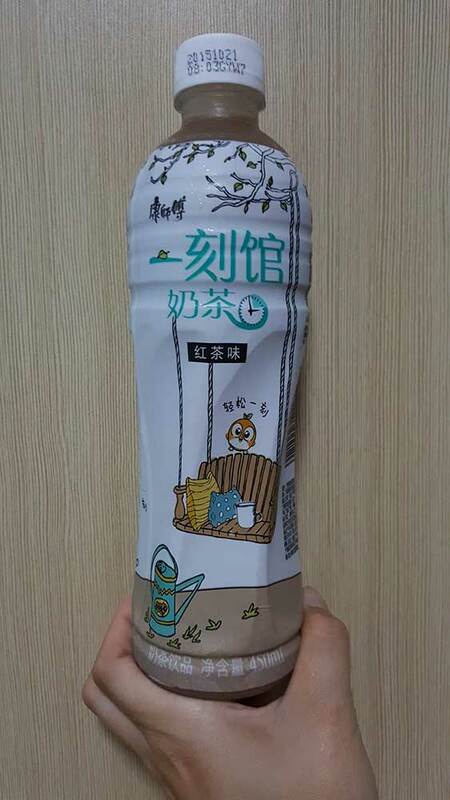 MP2: Will the beverage inside be tea, sir? You know how every Kickstarter video or tech-company tutorial has that same music? The jaunty acoustic guitar piece with someone whistling? That annoying music is exactly what popped into my head when I saw this bottle. Do doo, peep peepeep peepeep. Do doo, peep peepeep, peepeep. Incidentally, it was milk tea. Not bad. 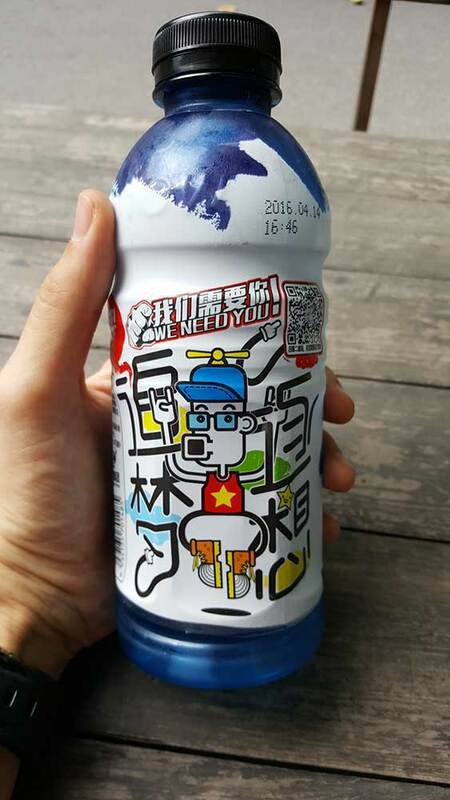 “We need you!” this bottle decries in English. What could be inside? I ask myself as I pull this squarefaced, Vietnamese shirtwearing, propellerheaded goon from the fridge. Just looking at him now makes me feel mildly irritated. I have a suspicion that if he could speak, it would be in a goofy, low-pitched voice with a lot of dribbling and slurping. “Hey, I’ve got a great idea!” he’d say in his stupid voice, and then he’d come up with the worst, most annoying idea imaginable, like seeing how many rubber bands we could stuff into our mouths or something. I didn’t even realise that the drink was expired until after I’d opened it. It tasted like blue Powerade, but it was full of chunks. The interesting thing about these chunks was that when I peered into the bottle… they weren’t there. A big question here is whether or not that monkey-man is running towards us or away from us. Either way, it appears to be a run of terror due to the icicles raining down upon him. But in his mind, are we the cause of this death-shower (running away) or are we able to somehow help him (running towards)? Sadly, questions like this don’t get answered nearly enough in the fast-paced world of beverage consumption. There just isn’t the time. 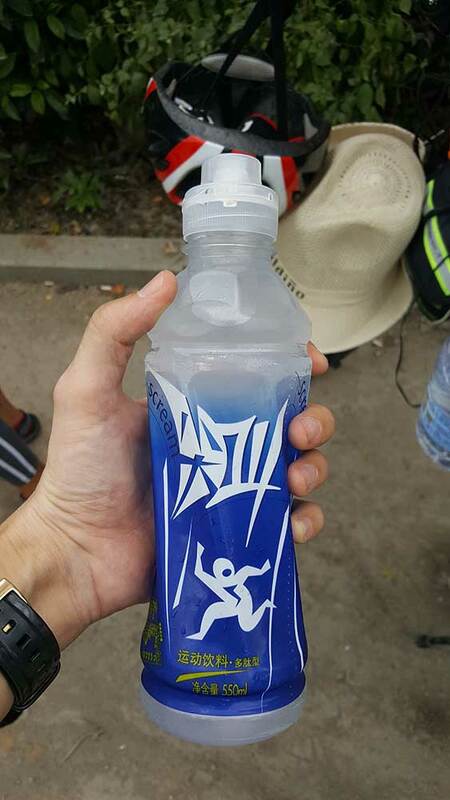 The liquid inside tasted kind of like powerade (again). It had a kind of lemony burst with that good old fashioned isotonic flavour we all know and love. As you can see, the ‘monkey-man being chased by icicles’ bottle is part of a series. In the green version he’s discovered that the icicles can’t actually hurt him so he’s doing a little celebratory dance. This green one was tasty and refreshing. It had a flavour a bit more like lime, but still with that unmistakable Powerade edge. The monkey man calls to his brethren, “Hail, fellows, the death rain cannot hurt us. Rejoice!” and they all live happily in isotonic paradise. But this orange version was disgusting. It tasted like soil and mushrooms mixed with cinnamon. I hate to waste things, but I couldn’t finish this awful drink. I think it probably reduced my life by several hours. And I’ve just reduced yours by several minutes. God there are some weird ones right? I never understood the citrus flavoured milk products. 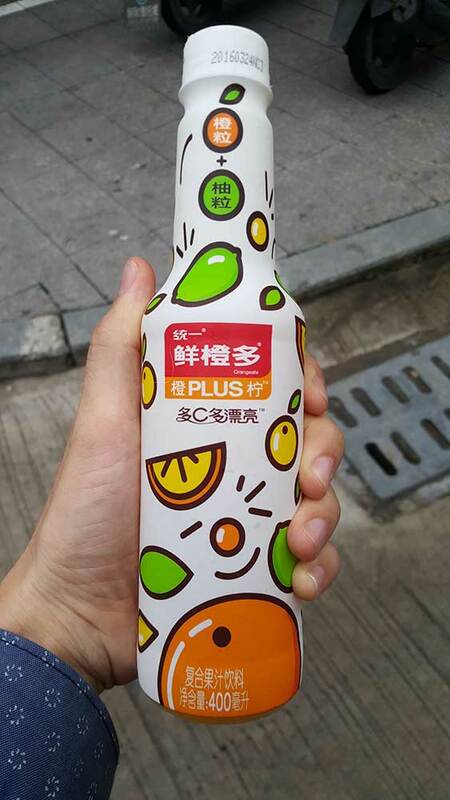 I am pretty sure milk curdles in the presence of orange juice, but somehow the Chinese get them in a bottle together. 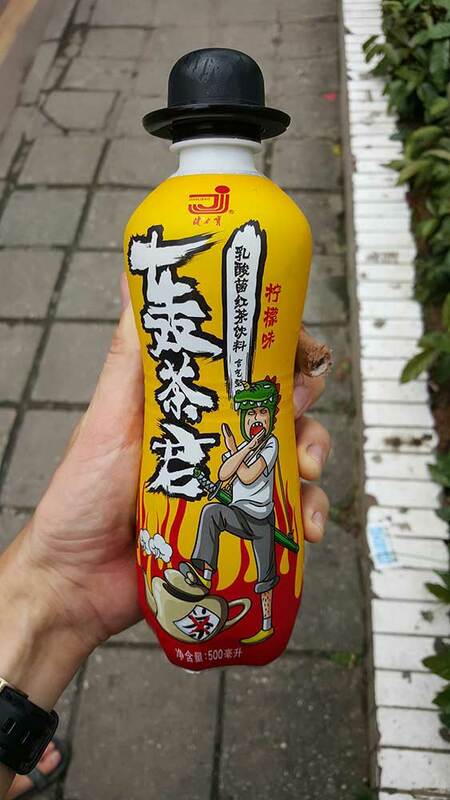 That flaming yellow gator samurai bottle is a work of utter marketing genius!